Back in 2010, Eugen Systems put an interesting spin on the RTS with R.U.S.E., which replaced tank rushes with pretend tank rushes. What fun! Their latest game, Act Of Aggression, is out today and has no such aspirations to remix the genre’s time-honoured conventions. Bring in the tanks. Here you come, RPG-carrying soldiers. Hello, dusty theatres of war. 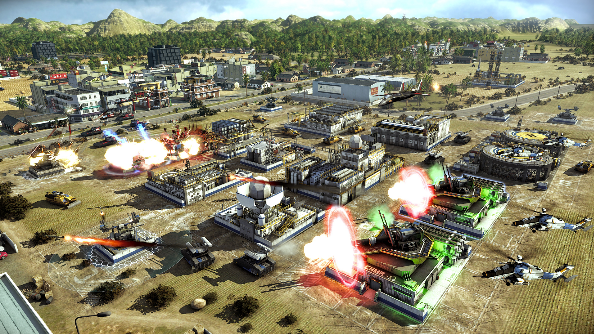 Offering up to 4v4 multiplayer, Act Of Aggression promises a return to the ‘golden age of RTS.’ Which for me was the one round of Supreme Commander 2 that I managed to make an ACU rush work on my unsuspecting, and far superior, friend. It’s about time a studio made a game to commemorate that glorious victory. It’s a three-way scrap between the U.S. army, the Chimera, and sinister PMC The Cartel, bringing two separate campaigns with intertwining chronologies, presumably involving many ‘and then the Chimera turned up with 450 tanks…’ plot points. If you move very quickly – like, really quickly, you can still get 15% off by pre-ordering on Steam.